High performance leaders are essential to every organization. For a multitude of practical reasons, stress, depletion or even burn-out can take a toll on their abilities. While cognitive coaching can help manage the activities, it doesn’t address some of the underlying emotional components at the heart of the matter. These issues may be systemic to the leaders core beliefs and have served him/her to achieve their success. But they may actually leave the leader isolated and out of control. Light BDG has over 10 years of experience working with leaders who have lost their core strength and were in need of a more inside-out approach. Combining effective assessment tools, cognitive coaching, and mind-body therapies, Light has helped them identify inefficient core beliefs and thinking patterns. By accessing and excercising the brain differently, the leader is able to restructure neural pathways and improve their emotional intelligence and health. This process profoundly impacts their capabilities, leading to positive results for their organization. We have found that using a multi disciplinary approach described in this case study, our client was able to improve her Total EI scores 26%. (we have used the EQ assessment to establish a quantifiable benchmark) While these improvements are substantial, the most noticeable change is the Self-actualization she has developed giving her a new sense of self, core-strength, and purpose in her work. Janice is a high performer. She has an MBA from a prestigious school in the Northwest. She has started several successful companies and held leadership roles in several industy associations. She has a reputation as a “fixer”, and is known as a master of creating a well-organized and profitable businesses for her customers. Her drive and unrelenting pursuit of excellence permiates every aspect of her life. Janice was facing a transition, something which had previously come easy to her, but had become difficult. The more she attempted to move towards her goals by reading books and having conversations with advisors and colleagues, the more confused, frustrated, and stuck she became. Her problem was not with ideas, business plans, and insights; her problem was within herself. There was a mind/body/brain issue getting her derailed and she was not functioning at the high level she was accustomed. What had worked in the past, was not working now. Although successful managing others and business problems, she was now having trouble managing herself. It became very clear in Janice’s initial interview that she had become derailed and was not making decisions from a position of internal strength. “I’m not hearing my inner guide or even recognizing or following it. I feel confused and conflicted with ‘typical’ career paths that have never been a problem for me. I feel like I’m waffling on decisions and they feel emotionally charged – I have a short fuse and overthink everything”. These were some of the struggles Janice reported. 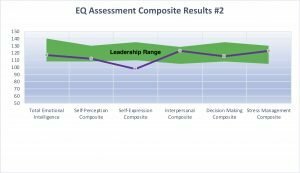 The EQ assessment results confirmed what Janice was saying, her highest scores were in categories relating to Interpersonal Relationships and Reality Testing; she scored at the low end of the range that most successful leaders would score. Her successful history reflected her ability “fix it” for the customer and communicate what she was doing effectively to the customer. She scored well below the mark in those categories that would give her strength in self management: Self-Perception, Self-Expression, and Decision Making when stress or emotionals are involved. Over the next several months, Janice worked to build her core emotional strength. She addressed old brain firing patterns that had been getting her triggered and derailed. She participated in the three elements of one-on-one leadership development coaching 1) The therapeutic frames of Lifespan Integration and CIMBS. 2) Deliberate Practice Coaching. 3) Coaching in Executive Presense. The first phase of coaching with Janice was to establish her presence and ability to master her anxious reactions. As we guided Janice to intentially focus on the body reactions that were occurring in the session it became clear that Janice’s brain wanted to shift away from being present in her body. In less than 15 seconds of body focus, the ideas were flooding into Janice’s mind: “doing lists” or advice for the coach(“I might have some business ideas for you”). This was way too familiar; it was a lifelong pattern for Janice and it was now becoming a roadblock to success..
She became successful in business by meeting other people’s needs, her brain didn’t know how to include attention to her own needs in the process. As Janice become more self-aware, she began to make the connection that her parents had “unreasonably high expectations for her”. And, at a young age she was required to take care of her younger siblings after school, while her parents worked. In High School, she did not participate in extra activities because she was required to work and ‘contribute to the family’. “Dad and Mom were always challenging me to work harder on my school work, get a job, and be responsible. And, of course, I had to help with my younger siblings every day”. For the past 44 years, Janice’s brain had exercised focus on others and her brain-map was built to serve others. In order to grow core strength, her brain would need more exercise to stay focused on herself (grow self awareness, not selfishness) when in the context of someone else. When High-Performers first begin to pay attention to themselves, uncomfortable realities show up. Some executives begin to notice the price their work has taken on their health, their families, and their dreams: we often call these soft opportunity costs. Feelings of loss often accompany these ideas. Janice began focusing on the brain firing patterns that were created as a result of growing up in her family system. In one session Janice focused her work on the life script, “I have to be better than them to matter”. In another session she addressed a traumatic situation that occurred when she was 9 years old. Towards the end of the work, Janice chose to focus a few sessions on problematic issues within long term relationships. The efficiency of the model allowed her to clear some trauma and put healthier perspective to the meaning of those relationships. Deliberate Practice principles were also used in coaching sessions where a problematic situation was discussed and then processed. In one session Janice needed to process a conversation with a business colleague. She had a lot of feelings around an issue and her anxiety was high as she anticipated the conversation. Her lack of sleep and “squirrel-caging” thoughts were getting her stuck. Cindy coached her to “be in the conversation” and say what you would say. It became quite clear that Janice was obsessing about the past relationship, which was not helpful to the conversation she wanted to have about aligning around their future. Janice was able to practice saying what she wanted with greater authority and clarity, even though it was emotional for her to finaly let things go. This type of coaching is very focused, creative, and it allowed Janice to excercise her brain to practice new words with confidence, which built new brain firing patterns. Janice is a different leader today. She has a clear vision for how she will move into new venture(s). Now, she is aware that helping others needs to be balanced with her role and responsilities. She is respecting her limitations, creating better boundaries around her own negative thought patterns, and has greater gratitude for others’ contributions. She is communicating her intentions more clearly in all of her relationships, both professional and personal. This is how Janice states things now, “I can support myself and my position, as I offer some help to the people I want to help. It doesn’t feel ‘all or nothing’ anymore. I feel like I have a right to be in the situations in my life. I can listen to my emotions and body and evaluate if my reactions fit my current situation or past issues. I can let go of things more easily and not over think”. Janice is now exercising her personal authority in a balanced, sustainable way, with respect for herself and those in which she interacts. In order to measure the results of Janice’s work, she completed a post-coaching EQ Assessment. She had been reporting progress throughout the work, but we had no idea that level of cummulative transformation that occurred. Janice had improved her overall EQ score from 93 to 117, an improvement of 26%. As the chart shows, she was now operating in the leadership range in nearly all categories. Her Decision- Making Composite (comprised of: Problem Solving, Reality Testing, and Impulse Control) improved 29%. The lowest improvement was a 16% gain in the Interpersonal Composite (comprised of: Interpersonal Relationships, Empathy, and Social Responsibility). This was largely due to the fact that she was already quite high in this area and now was at the high-end of the leadership range. In conclusion, this demonstrates the ability for high performance leaders to significantly manage brain processes. They can subsequently improve their emotional intelligence, core strength, and internal authority. With a new outlook, we believe a leader’s ability to fully engage with themselves and others can lead to a new system of outcomes. These improvements can have a significant impact across.